anotherdayatthewj | Saddle up and enjoy the ride! ~ Saddle up and enjoy the ride! It’s What We Do Here…. This past week, Mother Nature played a very nasty trick on the Midwest. A “Bomb Cyclone” is what the weather service called it. I can’t tell you scientifically what a “Bomb Cyclone” is, but I can tell you what it did. Heavy rains caused rapid snow melt which sent rivers and waterways to record levels and beyond. Dams and levees broke. Bridges and roads washed away. Complete farms, ranches, homes and livestock washed away, never to be found. Lives lost. Some of the worst devastation is just miles from where we live. Our little ranch is fine. Are we calving in mud higher than our muck boots? Yes. Do we have water in our basement? Yes. Are we doing okay? Absolutely. Today, Greg & I drove to Verdigre, NE where they were beginning clean up as the water had receded. We have no real connection to Verdigre, other than a few years ago we rented pasture near there. We would eat at the local cafe and grab a kolache from the bakery. But today, we joined numerous others from all over our area to pitch in and help. At the house we were assigned, the fire department pumped water out of the basement. We waited a long time before enough water was pumped so that we could begin taking things out. (note force of water being sent into the street drain. This went on for a long time) One man suggested the idea of making lines to be more efficient. There were no debates on whether that was a good idea or how it should be done. Everyone just joined together and did it because it worked. We were strangers of all walks of life, coming together for a common cause. It was like fine clockwork. We made a line from the house to the curb to hand buckets of sludge and mud-soaked possessions from one person to the next until it reached the trailer ready to go to the dumping area when filled. As I handled each item as it passed, I realized I was holding a piece of that family with every hand off. Books, child’s toys, family movies, important papers, furniture and so much more, all water soaked and full of cold, slick, slimy mud. I saw the hurt in the owner’s eyes. More like a look of disbelief, really, but an ache just the same. In that instant, I realized that possessions are just that, possessions…things. We don’t come into this world with them and we don’t leave this world with them. At another house, as the owner watched his possessions being thrown into the trailer, he said “I’m most anxious about getting a new water heater, taking a shower and having hot water again someday”. Wow. He didn’t say “I can’t wait until I can replace my computer or television.” He was missing hot water. How many things do I take for granted each day? Born in South Dakota and now a Nebraskan, I am so proud to be from the Midwest. It’s what people do here. We help each other in time of need. So many people came out today to work with people they’d never met to help people they’d never meet. This morning in our church, one of our members said he was going to put a can in the back of the church and collect money for water and supplies to take to our flooding neighboring towns. In an hour, there was $2,100.00 in that can. Today, we worked beside policemen, firemen, EMTs, medical personnel and others who either voluntarily or professionally give their time to help those in need. They do not get the thanks they deserve. In fact, sometimes it’s the opposite. As Mr. Rogers would say “there are always the helpers”. I said a prayer of thanks for them today. You should too. You haven’t heard about any of this on the nightly news. You haven’t heard about our massive floods in Nebraska. You haven’t heard about 500 damaged homes in one Nebraska county alone. You haven’t heard about the farmer who lost his life when his tractor was swept away as he tried to help a stranded motorist. You haven’t heard about the ranchers who had to cut fences before they fled for their lives, only praying that their beloved herds could save themselves and now are overcome with grief as they uncover dead stock. You haven’t heard about the family who’s 5th generation ranch was swept away. You haven’t heard about the miles of water that have overtaken ranches, farms, houses, livestock, pets and fields. You haven’t heard about what life changing events are taking place in Nebraska. You also haven’t heard about the people who are coming together to help each other. Why? Because the news seems to concentrate most on the “important headlines”. You know the ones, right? The Hollywood scandals and never-ending political bashings. They call Nebraska the “flyover state”. Let me tell you something else about Nebraska. Nebraskans are tough. Nebraskans are strong. There is an unbelievable amount of work ahead of many people. However, we will pray together, work together and rebuild together even stronger than before. Yes, they say Nebraska “isn’t for everyone”. I always knew that was a correct statement. I am proud to call the Midwest my home. I’m splattered with mud from my knees to my head. My boots weigh a ton, like they’re filled full of lead. And, this you say, is what ranching’s about?? Said my wise husband with a bit of dismay. But the grass is ready and we’re about out of hay. “We’ll be fine” he said as he struggled with the gate. It was stuck in the ooze. …And so was his mate. But in a foot of mud, let the merriment commence! A moment of irritation is suddenly now showing. Hubby mumbled under his breath as he went for the tractor. But we got the job done. What a relief. Everyone’s calmed down, although a bit spent. It’s no secret that ranching’s not always so fun. But you do what you have to and get the job done. Next year can we do something different on Mother’s Day? It’s calving season at the ranch. I love this time of year. Those new baby calves arriving give me hope for the renewal of spring after a long winter. When those little guys jump and play in the sunlight as their momma munches hay and looks on, my heart does a happy dance. But, ranching/calving isn’t easy. I don’t think many realize the tremendous amount of work that the calving season creates for the rancher. I am also positive that people do not realize the love, dedication and commitment that a rancher puts into a successful calving season. My husband and I have a relatively small herd compared to many and yet I know the hours of struggle we put into making sure that all goes well. We are having an incredibly long winter. Even though the calendar tells us it is spring, we are having cold temperatures and lots of wet, heavy snow almost every week. This is making calving a nightmare. There is an unwritten, but very accurate “Pregnant Cow Law”, that states if there is a weather front moving in, the cow will certainly go into labor. This means that on those really cold, wet and snowy nights, we take turns getting up to go outside and check on everyone. A calf born in cold wet snowy mud doesn’t stand a chance even if momma is trying her best. We painstakingly work to make sure we pen up the “heavies” (or those gals that look like labor is on the horizon). Invariably, though, there’ll be a calf born outside that pen (you know, some ladies just carry their babies more gracefully). We want to find that baby right away, no matter the hour. P.S. Do you know how hard it is to try to get back to sleep after you’ve gotten up at 3 a.m. to fully dress yourself in warm clothing, boots & hat, go outside in the howling wind and cold to walk through the “close-up calving pen” with the spotlight and then come back in to get “ready for bed”?? It’s hard. Darn hard. When the snow melts and the mud is so deep that you lose a boot as you walk across the pen, one tends to have trouble controlling their language at times. I’ve lost a few boots in my day and that mud is intensely COLD on a stocking foot (not to mention the wear and tear on the washing machine!) Sometimes we are carrying a baby calf through this mud to a dry pen (trust me when I tell you that those babies are wet, slippery and heavy. Dead weight heavy. And did I mention slippery?? Then there are the times when momma has difficulty and you may be working with a prolapse (for those of you who don’t know what that is, I’ll spare you. Look it up. It’s not pretty) or a heifer that’s having trouble. And, we are there. Making sure to do everything in our power to assure momma and baby turn out just fine. Sometimes there is an especially touching moment in calving. A calf that you’ve nursed back to health or maybe a little one who’s new momma didn’t quite know what to do to take care of him, but with patience showing her, both are doing well. Or, as happened yesterday, a new set of twins born to a seasoned momma. This is quite rare, but amazing. Sometimes, mother cows can’t handle two babies. They’ll tend to mother one of them and the second one is orphaned. But, our “good old number 4 cow” has decided that having two babies is just fine with her and we are grateful. It’s a joy to watch her take care of her twins. I’m thankful for her babies. I’m thankful for her. So, why do we do it?? Why do we go to all of this trouble?? Because we see God every time a calf is born. Because we see God every time we watch a calf nurse. Because this is what it means to be a rancher. Work. Hard work. Terribly hard work, but with magnificent reward. This creation of life and caring for these creatures stirs up something inside of me that makes me thankful. Thankful to be a caretaker of God’s handiwork. Thankful to be working with cattle. Oh, yes. And thankful for Momma #4. It’s December at the ranch. Winter came overnight. And button my coat at the peek of daylight. For that first morning hay that’s thrown on their plate. But as I stand in the barn I know it’s enough. So that we might have life and live eternally. I’m reminded that barns are where great things take place. It’s been a busy summer. My last post referred to my apprehension as I anticipated what an “empty nest” would feel like. I am 3 days into my “empty nest life” and my quiet house seems more quiet than I even imagined. We moved our youngest to college this weekend. It was evident he was ready to spread his wings, which is what we raised him to do, but there is something so very different about that youngest one leaving. My husband is supportive of how I reacted (which was to cry for at least half the way home after saying goodbye), but he doesn’t really get it. Mothers just have something in us that creates a “momma bear protection mode” over our children, which in turns causes worry, right? Moms worry about everything when they head to college: will he wear his seat belt when he is driving? will he get to class on time? will he meet the right people? will he meet the WRONG people? will he oversleep? will he get his class schedule figured out? will he study? will he spend his money wisely? will he spend too much time socializing? will he be safe? will he pick up his clothes in his room? will he brush his teeth? (Okay, maybe not the last one, but you get the idea) You know…it’s just a mom thing? Dads say “He’ll be fine. Quit worrying”. Here’s my struggle. As a Christian, I fully believe that worry is a lack of faith. My head has always told me that and yet, as an “empty nester”, in my heart I find it hard to let go. When your child goes off to college, you suddenly come to the abrupt realization that you no longer are in control. You’ve done the best you’ve known how, but it becomes vivid reality as you think about them being on their own. These feelings were all within me on Friday evening after we got home from helping our son move in to his dorm room. Our house seemed emptier and more quiet than it ever had been before. One of his socks was on the bathroom floor and when I picked it up, I just lost it. That night, I went to bed and prayed this prayer “God, you know my heart. Please give me peace about this stage of my life. Take care of my child and allow him to meet those people who are positive and faithful people. Give him a desire to learn and grow. He is yours and I thank you that you gave me the opportunity to be his mother. And p.s. if you could somehow give me a little sign that he’ll be okay, I’d be greatful”. I woke Saturday morning feeling kind of blue. I made a cup of coffee and grabbed the morning newspaper. I opened it up to this. A life size photo of my son looking happier than ever with the large heading “ACHIEVE” over his head. Our little county fair took place about 3 weeks ago. This article was written about the 4-H fair results. My son shows poultry and this was his last year of 4-H. A newspaper reporter had taken this photo when we were checking in our poultry exhibits. Little did we know it would go to print, let alone be the feature photo. This 4 page insert in the newspaper had many photos of kids and their projects. My son’s was the largest and in color. My son’s was the front page with the heading and word “ACHIEVE”. You can call it a coincidence that the reporter chose my son’s photo to be the front page. You can call it a coincidence that the word “ACHIEVE” was written above his smiling face. You can call it a coincidence that the photo is probably the very best one I’ve ever seen of my son’s smile. You can call it a coincidence that the article came out less than 12 hours after college move in day. You can call it a coincidence that I prayed for a sign from God and when I woke, this greeted me. You can call it coincidence. I call it God’s sign. God is in control. My son will be fine. I will be too. A couple weeks ago, our youngest graduated from High School. Our baby boy!! I was pretty emotional about all of this. I’m not looking forward to the “empty nest” that everyone talks about. I am extremely proud of our son (he’s one talented young man with a bright future) but graduation was a bit hard for me to swallow. However, now that it’s behind me, I’ve decided to think about what I’ve learned from the experience. Here’s one: Why do we pick graduation as the deadline to finish home projects? I remember laying ceramic tile in our entry the night before our daughter’s graduation a few years ago. We were up until 2 a.m. finishing that floor. How stupid is that? We have friends that finished an addition just before their son’s graduation and another couple we know did a large landscaping job right up until the big day. Everyone uses graduation to finish projects that they have talked about doing for years. Why do we put ourselves through that!? When our kids begin kindergarten, we know that in thirteen years he/she will graduate. Thirteen years equates to 4,745 days. We have had 4,745 days to get those projects done before graduation day and what do we do? Begin our projects on day 4,743. #1 Lesson Learned: Preparation is an Overkill. The menu is always a huge deal. You want to have food that people still enjoy after having eaten at 10 other graduation parties prior to coming to yours. We did a burrito bar. My son also requested deviled eggs. Now, the burrito bar I could handle, but the eggs were going to be a problem. You see, they contain the ingredient mayonaise, which to me is the equivalent to some type of hazardous material. I can’t stand the stuff, nor do I want to smell it, touch it or be within 10 feet of it. Deviled eggs without mayonaise are…well, just boiled eggs. What was I to do? I voiced my concern to a couple friends, and Wa Lah! Deviled eggs appeared at graduation. I also had wonderful friends who helped serve food that day so I could visit and enjoy the party. It is our school’s tradition that at the end of the graduation ceremony, an emotional song is either sung or played while the graduates each bring roses to their parents. This usually is the cause of many tears, sometimes on both ends (parents and seniors) I knew I’d have a tough time with it. When the song began, I was trying to hold it together and looked at my husband (the strong dad) and big tears were rolling down his cheeks. This didn’t help me one bit. Then I looked at my grown son who was heading our way with roses in hand. He had the biggest grin on his face and gave me a “thumbs up” while he mouthed the words “Don’t cry”. I knew right then and there that he was ready to move on with his life. He would succeed. There was no reason whatsoever for me to be sad about that. Lesson #3 Learned: The future is bright and I’m blessed to have a son who is ready and excited for what God has in store for him. Know what? People live through the “empty nest syndrome”. I will too. I’ll be just fine. That is, until I drop him off at college this fall! One of our dear friends went to be with Jesus last week. I wrote this poem as a tribute to a man who touched our family deeply. Just last week we got a call that shook me to the core. A dear old cowboy friend of ours was on this earth no more. He’d been feeling ill for quite awhile and there was nothing they could do. He’d put everyone else’s feelings first and his, well, they came last. We all have that appointment, but somehow his touched deep. There’s just some things about that man that in my heart I’ll keep. But when it came to this guy, he took things up a notch. But when he offered his opinion, you best pay some attention. When he rode a horse you noticed, that the horse and he were one. When he threw a lasso at a calf, that rope would never come undone. Was his faith in God that never wavered, even though there was that time.. I shudder when I think about it. All I can do is pray. But watch the scene unfold itself and pray it wasn’t true. It seemed it happened in slow motion, the cow was just too strong. Sometimes you do everything so very right and things can still go wrong. As he walked on steady with his Lord and his faith grew greater still. His family longs for his strong hand to give just one more touch. When he said “I can sum up this man’s whole life with just one little word”. Everyone in that room nodded, and their eyes teared up like me. But I know my life is better having had that cowboy for a friend. Knowing them makes me joyful in the midst of feeling blue. I know that Jesus is the Son of God and on the cross he died. And somewhere up in Heaven, dad and daughter ride side by side. Music has always been a passion. When I am singing, I am truly happy. I suppose that throughout my life, I’ve lived through various “stages” of the type of music that I loved. When I was in High School, I loved The Partridge Family and Donny & Marie Osmond (that ages me, huh?) When I was in College, my dorm room rocked Boston & Journey, but as a vocal major, I listened to opera and classical music as well. I was really into contemporary Christian music and still enjoy that. Artists like Amy Grant, Michael W Smith, Keith Green & Petra helped me through some of those tough maturing years as an 18-year old trying to find her way. Music can do that. It helps you feel emotion. It can help you reflect. It allows you to live special moments all over again by taking you back to that particular hangout or spot when you hear a certain song. Music touches the heart when many other things cannot. Outside of my faith and being a wife & mother, music is the largest part of me. For the many types of music that I loved and enjoyed, however, there was only one type of music that never wavered. Traditional Western, Bluegrass and cowboy music has been part of my being from the time I could talk. When other little kids were learning “Mary Had A Little Lamb”, my daddy was teaching me “Red River Valley” and “Home on the Range”. I couldn’t understand why the other kids couldn’t sing along with my songs, but knew everyone else’s. A dream came true last fall when I released my first solo album of traditional and western music. I’ve sung professionally all of my life but never really having the opportunity to sing the type of music that is really my calling. This album brought together some extremely talented friends and musicians and I am happy to share it with you. If you might be interested in knowing more, search my name at http://www.cdbaby.com. Music. Truly the whispers of the heart. The next time you hear a song whether on the radio or live or a song that you sing, let the song speak to you. Music has so much to say. It’s been 1 1/2 years since our barn fire. Life happens that way, you know? We journey through this life thankful for each day, but uncertain of what the day will bring. To see the beginning construction of this barn has hit me in a most interesting way. I’m excited, yes, but I’m also sad. I miss the old barn. I miss seeing that iconic old building built by strong calloused hands as a dairy barn to provide for a family in the early 1900s. 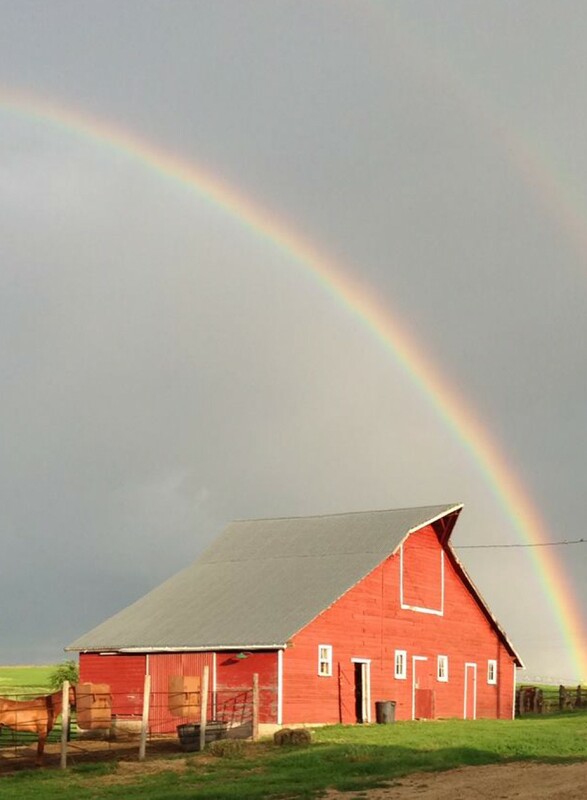 That old barn was such a statement to what our ranch stands for: tradition, values, faith and family. Just like that, it was gone and took a part of who we were with it. Now, I watch new hands build another barn. This one is a different shape, although we are trying to make sure it has an “old barn feel” to it. This one won’t be quite the same but will have some of the same functions of our old one. This one will begin a new chapter. This barn is a blank slate to begin writing stories about what happens within its walls. I hope that our four little grandsons will play for hours in this barn just as our children did in the old one. 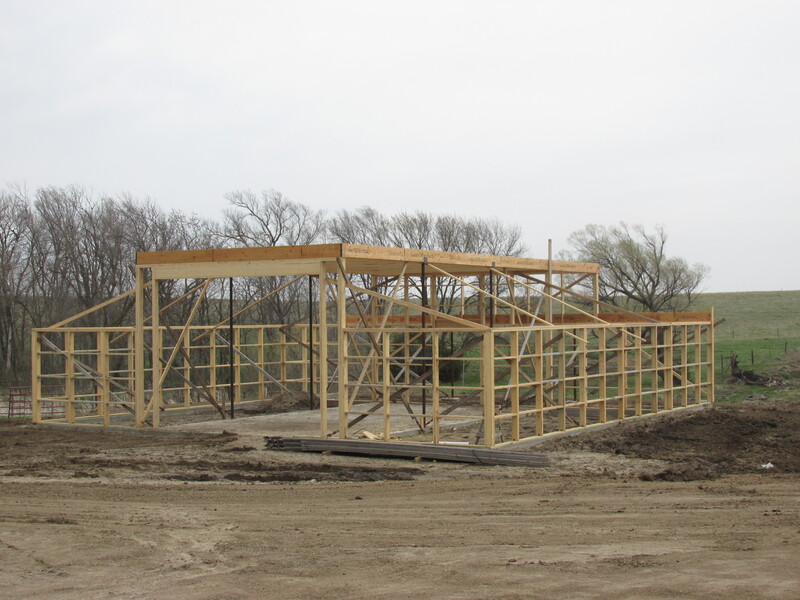 This barn will store the hay for our horses and cattle and be a shelter for them in the harsh winters. Yes, this barn is our new chapter as we turn the page. As I look out the window and watch the progress, I’m reminded that my life is full of “barn building”. We live from day to day not knowing what the day will bring. When things happen to us that are out of our control, we must make a choice to hold on to our faith and move on. Is it easy? No. Is it going to be exactly the same from now on? No. But the one constant is our Heavenly Father who can give us peace when the world around us fails. That feeling of peace is a gift. We can be excited about our “new normal” because it too is a gift. I’m excited to see this barn take shape. I’m excited to see what memories this barn will produce. I am at peace. And so it begins…. My Love Affair With SOUP! I have a confession. I love soup. I love to make soup. I love to eat soup. Maybe the idea of soup is seeming relevant right now because our weather forecast calls for temperatures well below zero in the next couple days. Well, tonight was two-fold. I’d been in a cleaning mood all day, so not only did soup sound good, I wanted to empty my fridge. Wa-Lah! 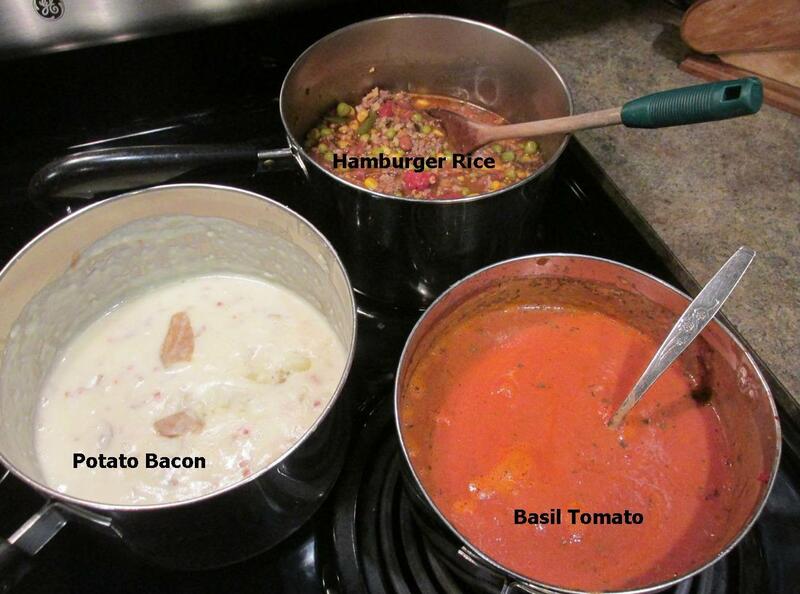 In just a few minutes, I had made 3 kinds of soups out of fridge leftovers! Want to see? These 3 soups were made from leftovers in my fridge in a very short amount of time (1/2 hour tops!) Wanna know how? I’ll tell ya. You can do it too. They were yummy, if I say so myself (I guess I just did) Plus, we had soup to eat for the next couple days which didn’t bother me one bit. Potato Bacon: A few nights before, I had made the old “meat and potatoes” meal (every once in awhile I have to feed my boys the traditional real deal or I have to listen to them complain about how we’re always eating “chick food” …which means fish, chicken and vegetables) I had about 1/2 saucepan full of mashed potatoes leftover. We mash potatoes with skins on (try it. It’s great) To those cold potatoes, I added about 1 cup half and half and 1 cup milk, 1 tablespoon chicken base (I don’t use bouillon at all. It’s too salty for me) and 1/2 can of chicken stock. 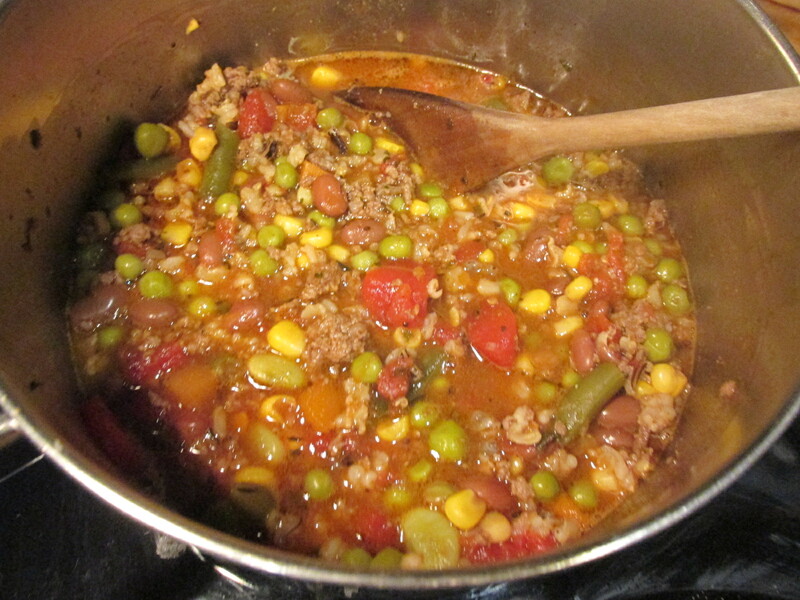 I whisked it all together and added a couple tablespoons of bacon bits and there you have it! 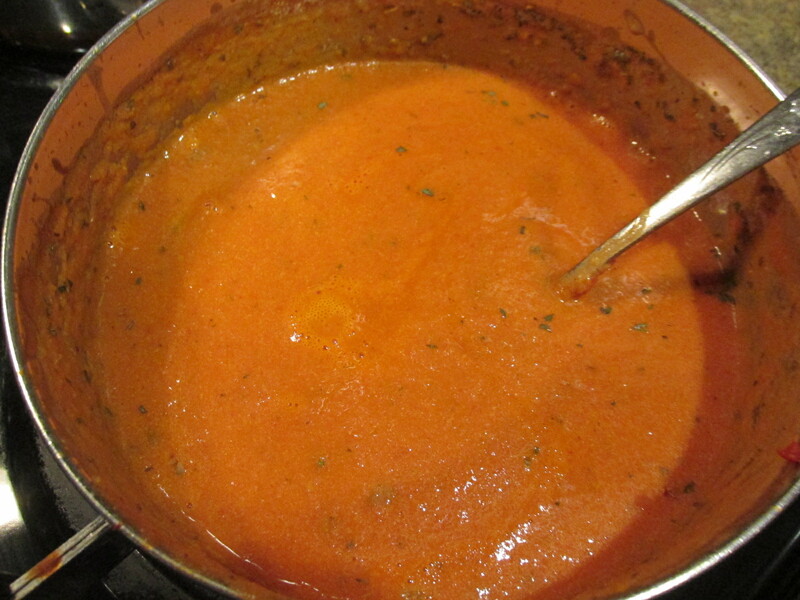 Tomato Basil: In a skillet, I sauteed 1 small onion, 2 cloves garlic, 1 stalk celery chopped and 1 carrot chopped. In the fridge was 1/2 can of diced tomatoes. I put the tomatoes in a saucepan and added 1 can tomato paste along with the sauteed veggies. Then I added the other 1/2 can of the chicken stock I used in the potato soup (didn’t want any more leftovers in my fridge tonight) I added 1 tablespoon basil and 2 tsp Italian seasoning. 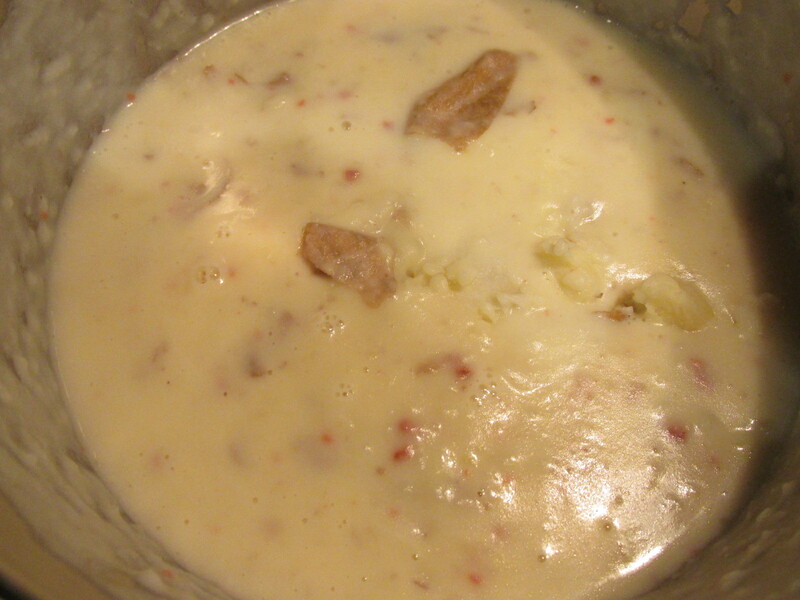 Last, I added equal parts of half and half and milk (depending on how creamy/thick you’d like the soup) That’s It. Hamburger Rice: Well, I’m the Queen of “don’t throw food out”. Whenever we have rice or vegetables for a meal, I’ll likely take any leftovers and put them all together in a ziplock bag in my freezer. The bag is marked “Soup” and it invariably has a mixture of all kinds of things in it. Tonight I browned about a pound of hamburger with 1 small onion. To that, I added 1/2 can of leftover black beans and leftover rice that were in the fridge (we had enchiladas a couple nights ago!) and my ziplock bag of frozen “soup fixin’s”. I added 1 can of diced tomatoes, 1 can water, 2 tablespoons of beef base and 1 tablespoon dried parsley, salt & pepper. There you go! Maybe you would like to try one of these soups when that cold wind starts to blow. Which, by the way, I’m beginning to hear. Better get out and feed the horses. Wonder if they like soup?